Do Maternal Grandparents Outrank Paternals? All grandparents are not created equal. Both scientific surveys and anecdotal evidence show that typically maternal grandparents are closer to grandchildren than paternal grandparents. The usual ranking goes like this, from closest to least close: maternal grandmother, maternal grandfather, paternal grandmother, paternal grandfather. Exceptions, of course, do occur. Some believe this difference is due to parents' role as gatekeepers between grandparents and parents. In spite of strides in gender equality, mothers are still likely to direct their children's activities. They may give heightened importance to contact with their own parents. Others hold that the relationship between a woman and her mother-in-law — the paternal grandmother of her children — is always going to be complicated. Possession, so to speak, of a treasured male, has been passed from mother to wife. A bit of jealousy and competitiveness is natural. Still, it may stand in the way of a close relationship, which may, in turn, stand in the way of closeness between grandparent and grandchild. Perhaps mothers-in-law are often unfairly criticized, but some tension is built into the role. Scientists offer a different explanation, an evolutionary thesis, which some observers discount. This scientific explanation holds that mothers are always certain that they are the parents of their children, whereas there may be uncertainty in a father's mind. Before the age of DNA testing, a father had scant means of proving that the child said to be his actually carried his genes. That goes doubly true for a grandfather wondering whether his grandchild is actually his grandchild. So the maternal grandmother knows with practically 100% certainty that her grandchild is genetically related to her. A maternal grandfather or a paternal grandmother has only half of that certainty, and a paternal grandfather has no certainty at all. Of course, many other factors affect the closeness of a relationship. Geographical closeness is important, although grandparents can overcome distance. A grandparent's employment status, health, economic status, and personality can also be influential factors. Another variable is the number of grandchildren a grandparent has. A grandparent with many grandchildren may find it difficult to spend quality time and bond with each one. The preference for maternal grandparents starts early, with maternal grandmothers being more likely to be invited into the delivery room. Similarly, the maternal grandmother is more likely to help out after the birth of a baby, facilitating early bonding with the grandchild. The grandparent who bonds early with a grandchild is more likely to be asked to babysit later on and is more likely to be involved in school activities when the grandchild starts to school. Studies with teens show that the advantage of the maternal grandmother does not dissipate with time. Studies of teen grandchildren are especially valuable, because teens are presumably old enough to initiate some contact with grandparents on their own, and because they are old enough to draw competent conclusions about relationships. The roles of maternal and paternal grandparents tend to diverge more widely when the parents of their grandchildren divorce. In spite of advances in gender equality, only about one in six fathers wins primary custody after a divorce. When a mother wins custody, the maternal grandparents often step in to fill gaps in parenting and to provide stability to the family. In the process, they tend to become closer to their grandchildren. This may also occur with paternal grandparents when the father gets custody, but that is a comparatively rare event. When the mother wins custody after a divorce, paternal grandparents tend to see their grandchildren less. They may, however, play an important role facilitating contact between children and their paternal families. The preference for the maternal grandparents isn't so clear when it comes to multigenerational living. If young people share households with their parents, cultural factors are likely to determine whether they will move in with the maternal or the paternal grandparents. Of course, other factors such as location and economics may override cultural patterns. In Indian, Bangladeshi and Pakistani families, young parents are expected to live with the paternal grandparents. 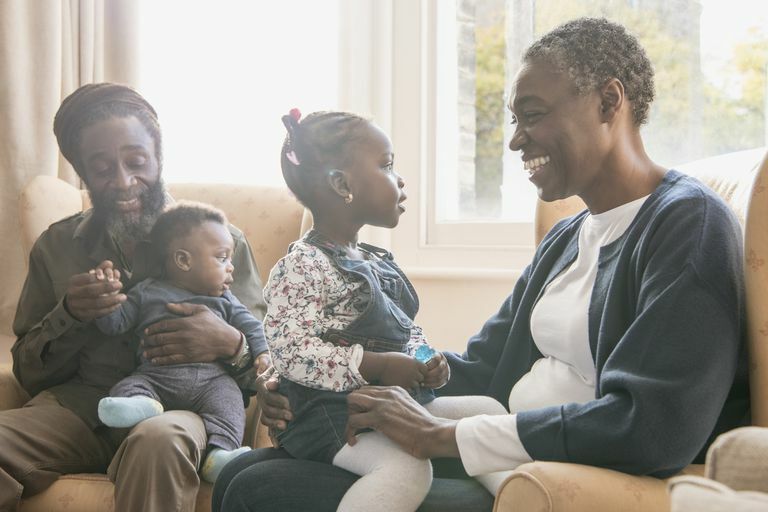 In Caribbean cultures, they may be expected to live with maternal grandparents. Needless to say, the effort put forth by a grandparent is always going to be the biggest factor in whether grandparents and grandchildren have a close relationship. Grandparents who want to be involved in the lives of their grandchildren and yet who manage to be respectful of parental roles have the highest likelihood of success. And this is true regardless of their position on the family tree.